Leaving the Masai Mara after breakfast with a picnic lunch, you'll travel across the 'breadbasket' of Kenya, past Narok and on to the vast plains on the floor of the Rift Valley. Watch for herds of giraffe and gazelle as you head up the Mau Escarpment, before arriving at Lake Nakuru. The waters here are often colored shimmering flamingo pink, from thousands of the beautiful birds lining its shores. Enjoy an afternoon game drive in Nakuru National Park before continuing to your lodge for dinner and overnight. Ask about confirmed air options, pre and post night stays. Group rates. Our journey comes to an end this morning as we drive back to Nairobi, arriving around midday. You can relax and catch up on the news in our partner's Club Lounge until leaving for a farewell dinner. Tonight you'll be treated to a variety of meats, all carved at your table (vegetarian choices are available as well). Then, it's off to the airport for your departure flight. Or, if you have more time, why not extend your trip into Tanzania? Have a look at our Kenya and Tanzania Special Value for just one idea -- or ask us to handcraft an extension just for you. All prices are based on a minimum of 2 people traveling together. Holiday supplement of $65 per night per person applies for travel between December 22 - January 5 and March 29 - April 4. Rates shown are per person based on double occupancy. Single rates are available. ​There is perhaps nothing more memorable than sitting in the presence of a Mountain Gorilla. With less than 700 remaining in the wild, the Mountain Gorilla is one of the most endangered species on earth. While their size may be very intimidating, they are actually quite shy. As you sit with a family of gorillas, their behavior may seem quite familiar! Young gorillas play among themselves like children. Mothers groom their young and the big Silverback watches over the entire family. It is an unforgettable experience. Leave Kigali very early this morning and travel directly to the Volcantional National Park office, where your guides will brief you on your upcoming trek and how to behave when you are in the forest and in the presence of the mountain gorillas. A short drive over bumpy roads takes you to the start of your trek. It will take about 10-20 minutes to walk to through the fields to the edge of the forest. 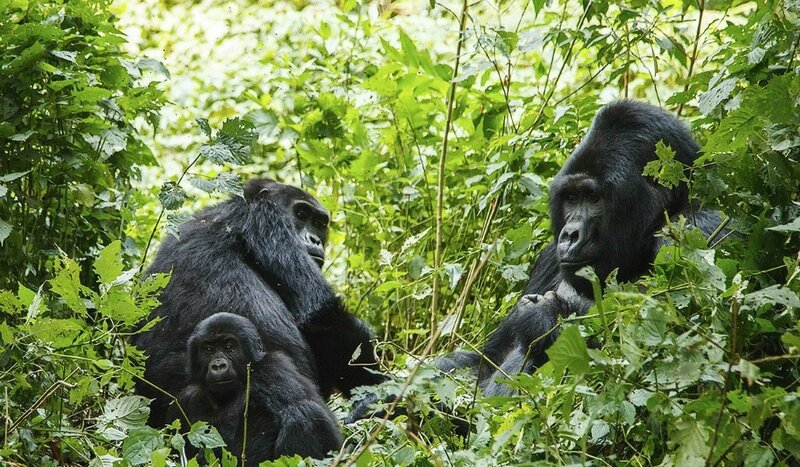 Continue your trek in the forest until you come upon your family of gorillas. For the next hour, as you sit with the gorillas, you will be filled with awe - some say this is the most profound experiences in nature. Your time with the gorillas quickly comes to an end, and you trek back to the start point. Return to the lodge for a late lunch and afternoon at leisure. ​Due to the special nature of this program, a non-refundable deposit of 30% is required at at time of booking and tour arrangements are non-refundable after 75 days prior to departure. Ask for details when you book. Gorilla Permit Fee of $1500.00 per person per trek is not included in the above tour price and is additional. You can add days/gorilla treks to this program. Holiday supplements apply - Add $65 per person per night for travel between Dec 24 - Jan 3 and April 5 - 10. This 10-day Kenya and Tanzania journey introduces you to some of East Africa's best game viewing area - and will make you want to return again and again. Start in Tanzania, where you will visit the wonder that is Ngorongoro Crater. This collapsed caldera is home to a wide array of wildlife and part of the excitement are the unfolding views as you make the descent to the crater's floor. Lake Manyara tops off your visit to Tanzania before you head into Kenya, where the most famous game park in the country, the Masai Mara is your first stop. Take in the Great Rift Valley with your stay at Lake Nakuru. In Nairobi, you have a chance to meet the beautiful Rothschild's giraffes before your journey ends. This is a perfect introduction to East Africa. Our journey comes to an end this morning as we drive back to Nairobi, arriving around midday. You can relax and catch up on the news in our partner's Club Lounge until leaving for a farewell dinner. Tonight you'll be treated to a variety of meats, all carved at your table (vegetarian choices are available as well). Then, it's off to the airport to board your homeward bound flight. All prices are based on a minimum of 2 people traveling together. Holiday supplement of $65 per night per person applies for travel between December 22-January 5 and April 14-17. This tour offers you maximum flexibility because every accommodation and every tour can be changed to fit your requirements. Would you like an extra night in Cape Town to go shark diving? No problem, we can add that. How about adding a night in Victoria Falls to include an exciting Elephant Interaction or a full day tour to Chobe. All possible. We have offered three of our most requested combinations to get you started. If you have different accommodations on your bucket list, let us know and we will design a tour just for you. Welcome to South Africa! Upon arrival in Cape Town, you will be met and transferred to your choice of hotel. Cape Town is South Africa's most beautiful harbor city. The remainder of the day is at leisure to refresh from your transatlantic journey. Cape Town comes alive this morning on an introductory tour of the city. There is no better place to begin than with Table Mountain. Weather permitting, take the cable car to the summit to take in the glorious views of the city below. Then, your drive takes you through Camps Bay with its white sandy beaches and on to City Hall where Nelson Mandela made his first public speech after being released from Robben Island. Visit the Company Gardens and then hear about Greenmarket Square, location of the well that once was the main water supply for the city. Learn about the Malay Quarter and the colorful Bo-Kaap homes before ending the morning at a master diamond cutter. Return to your hotel for a leisurely afternoon. Head out to the glorious Cape Point in today's full day of touring. Your morning starts early, as you cruise along the exquisite stretch of coastline known as Millionaire's Paradise, past Llandudno to the working harbor of Hout Bay. We will stop here so you can embark on an optional up-close-and-personal Seal Island cruise if you like. Then, we wind along legendary Chapman's Peak Drive, soaking in the spectacular ocean views before arriving at the Cape of Good Hope section of Table Mountain National Park. We meander back to the city via Simon's Town and the endearing penguin colony at Boulders Beach. What a glorious day! Fly to Mpumalanga or Hoedspruit this morning (flight not included), where you continue by road to your choice of private game reserve. 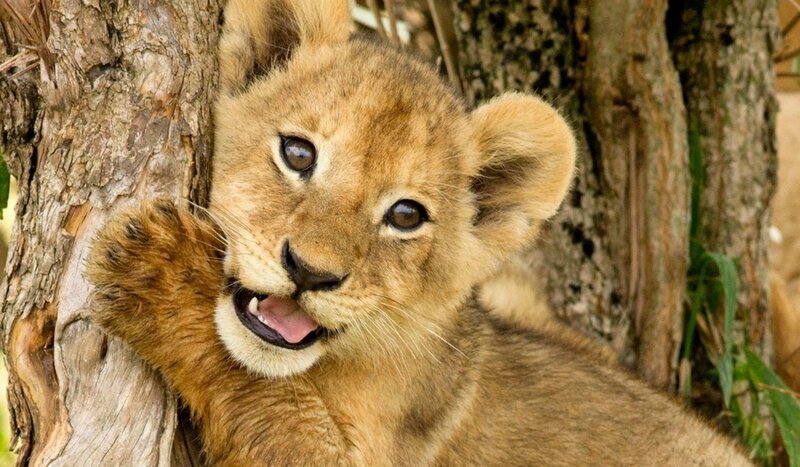 Later, get ready for exciting game viewing, as you embark on your first evening game drive. Many predators like lion and leopard hunt at night, so there's a good chance you might spot one on the prowl. This is big game country and during your game drives you're likely to encounter large herds of buffalo and impala, along with giraffe, elephant and much more. Your experienced Ranger will provide insight on what you see, along with the flora and fauna around you. Don't miss the opportunity to take a game walk with your experienced Ranger -- seeing the bush by foot opens an entire new world! Fly to Livingstone this morning, where you will be met and transferred across the border into Zimbabwe and your choice of hotel. Depending on the season, as you travel to your lodge, you might even see some of the spray rising up from spectacular Victoria Falls. Settle in and relax before enjoying a relaxing sunset cruise on the Zambezi River. All too soon your amazing experience comes to an end today as you are transferred to the airport to begin your journey home. All prices are based on a minimum of 2 people traveling together and are per person, land only. Airfare Cape Town-Mupumalanga-Livingston is not included in the Land Tour Price. 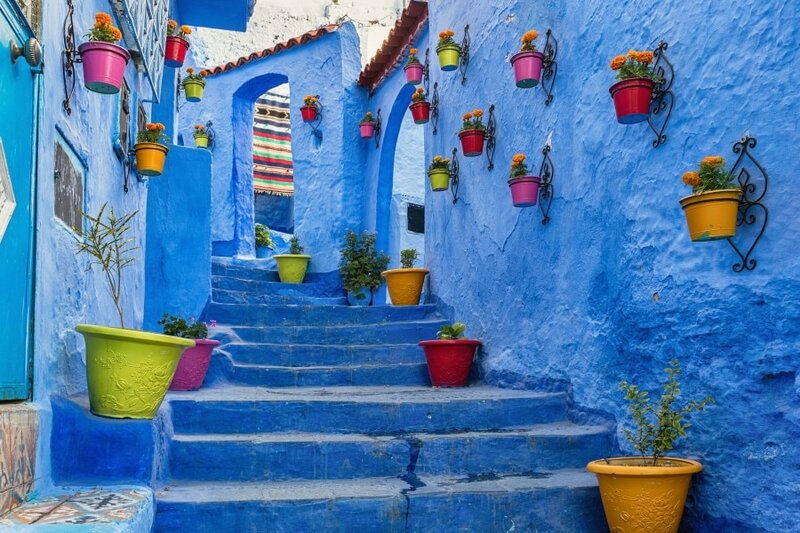 Board your overnight flight to Morocco (Please ask about our great deals).DAY 2WELCOME TO CASABLANCA. DAY 3IMPERIAL MEKNES, RABAT AND FES. DAY 4 - RELAXED STARTFES SIGHTSEEING. DAY 5THE ZIZ GORGES TO ERFOUD. DAY 7 - RELAXED STARTTO MARRAKESH. DAY 8 - RELAXED STARTMARRAKESH, PEARL OF THE SOUTH. DAY 9 - RELAXED STARTELEGANT ESSAOUIRA. DAY 10 - RELAXED STARTRETURN TO CASABLANCA. Twin prices are per person. Coach does not have an onboard washroom. Visas. Some passports may require visa, ask at the time of booking to assess your requirements. Pricing is subject to change. Tour prices and dates are correct at the time of posting, however are subject to confirmation at the time of booking. Prices displayed reflect available discounted rates such Early Payment Discount or Red Hot Deal (discounts are not combinable). All tour information is correct at time of tours going live, however is subject to change, please confirm all details at time of booking. Notes: Seasonal adjustments and/or black out dates apply. Coach used does not have an onboard washroom. Check to determine if you will need a visa for this tour. Book Your Air Early: To get the best land & air deal possible!